Elliot Bay Trail, Myrtle Edwards Park - Seattle, Washington. Looking north towards the Magnolia neighborhood. 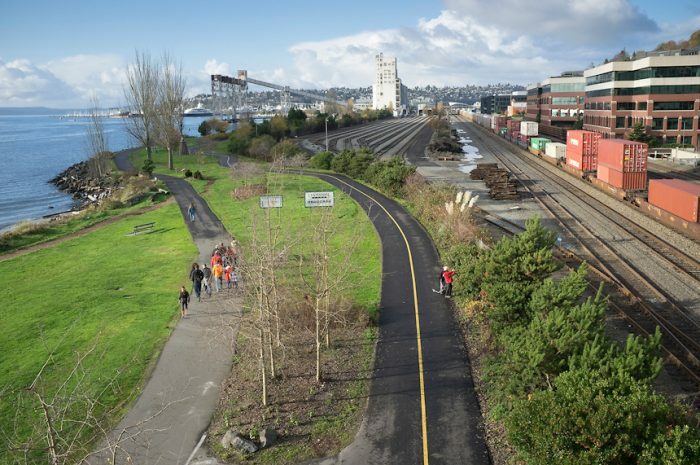 The main waterfront trail route along Puget Sound in Seattle is the Elliott Bay Trail, a scattered collection of trail segments that run from Century Link Field in the south to Smith Cove in Magnolia to the north — about 7 miles in total. There are various running options here. The nicest section is 1.5 miles one-way from Olympic Sculpture Park north past the Seattle Center, home to the Space Needle, on through Myrtle Edwards Park. The Myrtle Edwards Park portion has particularly nice scenery and includes a paved trail, limited street crossings and a flat run. It is also possible to continue along the trail, which is scattered in segments, about 3 miles to Smith Cove in Magnolia. Alternatively, the trail continues south to CenturyLink Field. fantastic issues altogether, you simply gained a new reader. What may you suggest in regards to your post that you made a few days ago? Any sure? Hey exceptional website! Does running a blog similar to this take a large amount of work? I’ve very little understanding of computer programming however I had been hoping to start my own blog in the near future. Anyway, should you have any recommendations or techniques for new blog owners please share. I know this is off subject however I just wanted to ask. Thanks a lot! Appreciating the commitment you put into your blog and detailed information you offer. It’s great to come across a blog every once in a while that isn’t the same unwanted rehashed information. Fantastic read! I’ve bookmarked your site and I’m including your RSS feeds to my Google account. hello there and thank you to your info – I’ve definitely picked up something new from proper here. I did on the other hand experience a few technical points using this website, since I experienced to reload the web site a lot of instances prior to I may get it to load properly. I have been pondering in case your web hosting is OK? Now not that I am complaining, however slow loading circumstances instances will sometimes impact your placement in google and could harm your high quality ranking if advertising with Adwords. Well I’m including this RSS to my email and could glance out for much more of your respective fascinating content. Ensure that you update this again soon..
Wow, amazing weblog structure! How lengthy have you been blogging for? you make blogging glance easy. The entire glance of your web site is excellent, as smartly as the content! Thanks a lot for giving everyone an extremely brilliant possiblity to read articles and blog posts from this website. It’s always so cool and as well , jam-packed with fun for me personally and my office colleagues to search the blog at minimum 3 times in 7 days to read the fresh guides you will have. And definitely, I’m also actually impressed concerning the amazing creative concepts you give. Selected 2 tips in this posting are unequivocally the most suitable we have had. Hey there! I simply would like to give you a big thumbs up for the great info you have right here on this post. Yes! Finally something about convert your car to run on water. Olympic Sculpture Park on Elliott Ave.